Well, this page says G'day to Australia! And don't forget New Zealand. ...or read on down the page and see what some Aussies have to say about their land down under. We may be taking this page down soon, but in the meantime, we'll tell you where to find their stories. Saw the penguins of Philip Island, birded in the Dandenongs and had a whirlwind visit to the city. If you want to find out more about Melbourne and it's surrounding read what our friend Marilyn has to say at Family Getaways Melbourne. We included a link to her on Australian Roadsigns. (You may not be driving there, but we did). She gives you her ideas on family getaways and fun things to see and do with your loved ones, in and around magnificent Melbourne. Great Tips for Travel and Vacation into the beautiful, spectacular countryside of Victoria. We were avid birdwatchers when we went to Australia the first time. We're not quite as avid now, but we still take our binoculars and pay serious attention to the birds anywhere we go. It makes you more observant of everything. And the birds are so wonderful in Australia, it could turn anyone into a birdwatcher. And there are adventures all over Australia. Want a do-it-yourself adventure? Queensland in north eastern Australia has some amazing places to visit. See FC4 Magazines for that. You can find them on that Aussie Roadsigns page too. Fish, Camp, 4x4... FC4 Magazines are the most comprehensive travel magazines in Queensland. Tropical NQ, Central Qld, Cape York & The Gulf of Carpentaria publications are a must for travellers to lovely Queensland. Find tourist attractions, national parks, golf courses, fishing and camping. 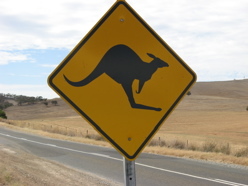 Please Note: MouseTours Travels provides these Australia travel links for your convenience. We do not warrant the performance, effectiveness or applicability of any sites listed. All links are for information purposes only and are not monitored for content. We disclaim any responsibility for the content and accuracy of these Web sites.